This chapter contains basic information pertaining to properties and identification of metal and heat-treating procedures used for metals. The internal reactions of a metal known as mechanical properties. The to external forces are mechanical properties are directly related to each other. A change in one property usually causes a change in one or more additional properties. For example, if the hardness of a metal is increased, the brittleness usually increases and the toughness usually decreases. Following is a brief explanation of the mechanical properties and how they relate to each other. 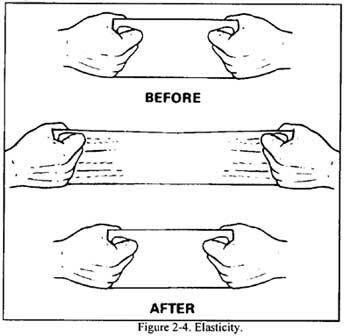 Shear strength is the ability of a metal fractured by opposing forces not acting in to resist being a straight line (Figure 2-2). 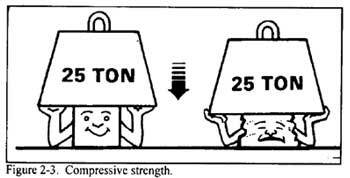 Shear strength can be controlled by varying the hardness of the metal. Machinability and weldability are the ease or difficulty with which a material can be machined or welded. 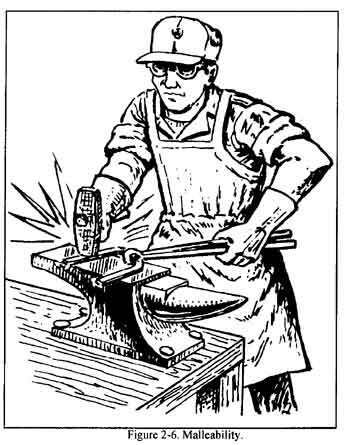 Part of the metalworker’s skill lies in the ability to identify various metal products brought to the shop. The metalworker must be able to identify the metal so the proper work methods can be applied. For Army equipment, drawings should be available. They must be examined in order to determine the metal to be used and its heat treatment (if required). If no drawing is available, knowledge of what the parts are going to do will serve as a guide to the type of metal to use. Simple tests can be made in the shop to identify metals. Since the ability to judge metals can be developed only through personal experience, practice these tests with known metals until familiar with the reactions of each metal to each type of test. This test includes such things as the color and appearance of machined as well as unmachined surfaces. Some metals can be quickly identified by looking at the surface of the broken part or by studying the chips produced with a hammer and chisel. This is a simple identification test used to observe the color, spacing, and quantity of sparks produced by grinding. It is a fast and convenient method of sorting mixed steels with known spark characteristics. 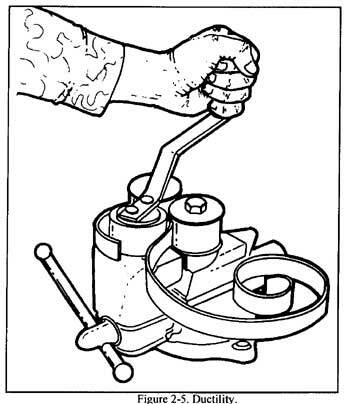 This test is best conducted by holding the steel stationary and touching a high-speed portable grinder to the steel with sufficient pressure to throw a spark stream about 12 inches long. The characteristics of sparks generated by a spark grinding test are shown in Figure 2-7. 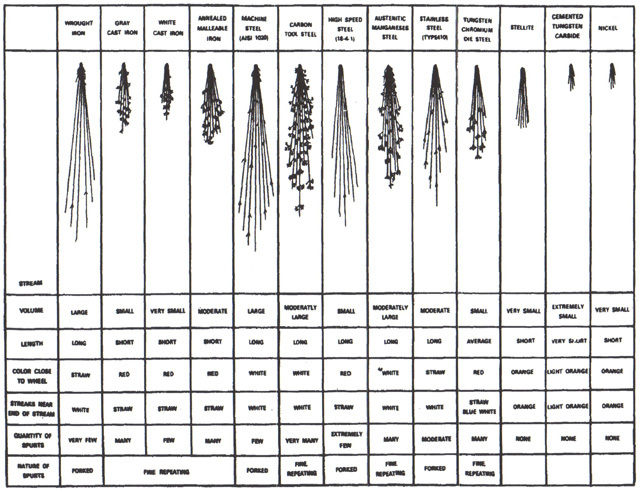 These spark patterns provide general information about the type of steel, cast iron, or alloy steel. In all cases, it is best to use standard samples of metal when comparing their sparks with that of the test sample. One simple way to check for hardness in a piece of metal is to file a small portion of it. If it is soft enough to be machined with regular tooling, the file will cut it. If it is too hard to machine, the file will not cut it. This method will indicate whether the material being tested is softer or harder than the file, but it will not tell exactly how soft or hard it is. 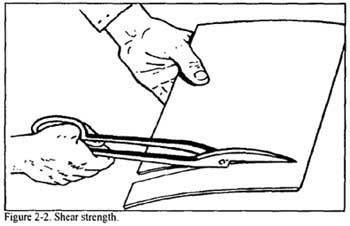 The file can also be used to determine the harder of two pieces of metal; the file will cut the softer metal faster and easier. The file method should only be used in situations when the exact hardness is not required. This test has the added advantage of needing very little in the way of time, equipment, and experience. This test determines the hardness of metals by measuring the depth of impression which can be made by a hard test point under a known load. The softer the metal, the deeper the impression. Soft metals will be indicated by low hardness numbers. Harder metals permit less of an impression to be made, resulting in higher hardness numbers. Rockwell hardness testing is accomplished by using the Rockwell hardness testing machine (Figure 2-8). 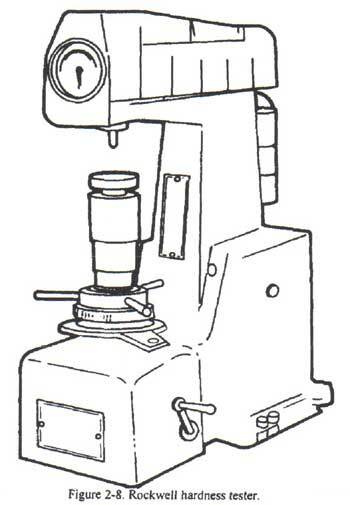 Brinell hardness testing operates on almost the same principle as the Rockwell test. The difference between the two is that the Rockwell hardness number is determined by the depth of the impression while the Brinell hardness number is determined by the area of the impression. This test forces a hardened ball, 10 mm (0.3937 in) in diameter, into the surface of the metal being tested, under a load of 3,000 kilograms (approximately 6,600 lb). The area of this impression determines the Brinell hardness number of the metal being tested. Softer metals result in larger impressions but have lower hardness numbers. Perhaps the best known numerical code is the Society of Automotive Engineers (SAE) code. For the metals industry, this organization pioneered in developing a uniform code based on chemical analysis. SAE specification numbers are now used less widely than in the past; however, the SAE numerical code is the basic code for ferrous metals Figure 2- 9). The SAE system is based on the use of four-or five digit numbers. 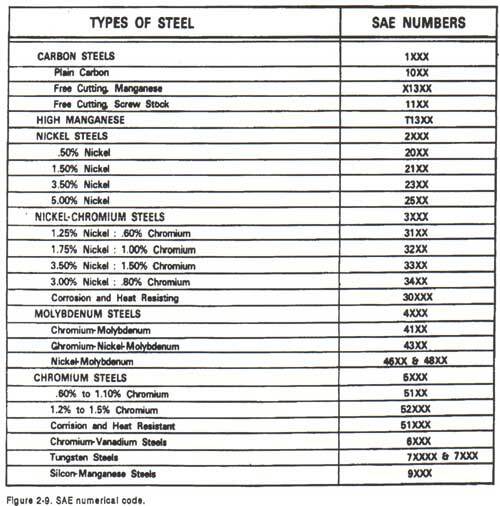 * The first number indicates the type of alloy used; for example, 1 indicates a carbon steel. * 2 indicates nickel steel. * The second, and sometimes the third, number gives the amount of the main alloy in whole percentage numbers. * The last two, and sometimes three, numbers give the carbon content in hundredths of 1 percent (0.01 percent). 1- Type of steel (carbon). 0- Percent of alloy (none). 45- Carbon content (0.45-percent carbon). 2- Type of steel (nickel). 3- Percent of alloy (3-percent nickel). 30- Carbon content (0.30-percent carbon). 7- Type of steel (tungsten). 16- Percent of alloy (16-percent tungsten). 50- Carbon content (0,50-percent carbon). 5- Type of steel (chromium). 0- Percent of alloy (less than l-percent chromium). 100- Carbon content (1-percent carbon). A system similar to the SAE classifications for steel and alloys has been developed by the Aluminum Association (AA) for wrought aluminum and aluminum alloys. This identification system of aluminum, as shown in Figure 2-10, consists of a four-digit number which indicates the type of alloy. control over impurities, and the specific alloy. The first number indicates the type of alloy. For example, 2 is copper, 3 is manganese, 4 is silicone, and so forth. The second number indicates the control that has been used. The last two numbers usually indicate an assigned composition. 2 - Type of alloy (copper). 0 - Control of impurities. 24 - Exact composition (AA number 24). Aluminum alloys vary greatly in their hardness and physical condition. These differences are called “temper,” Letter symbols represent the different tempers, In addition to a letter, one or more numbers are sometimes used to indicate further differences. The temper designation is separated from the basic four-digit identification number by a dash; for example, 2024-T6. 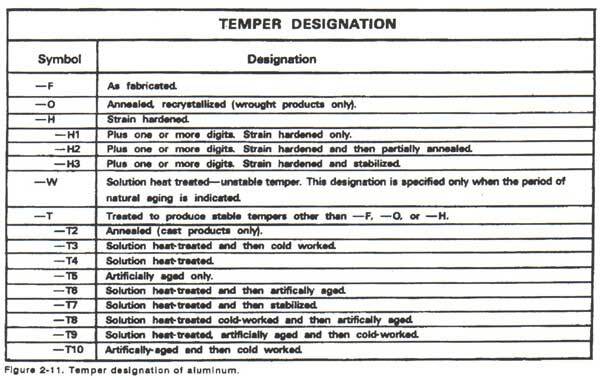 In this case there is an aluminum alloy, 2024, with a T6 temper (solution heat treated and then artificially aged). Figure 2-11 shows the numerals 2 through 10 that have been assigned in the AA system to indicate specific sequences of annealing, heat treating, cold working, or aging. A stencil and white or black paint, whichever shows up better on the metal being marked, should be used when the size of the metal piece permits. The federal or military specification numbers should be stenciled on the metal in vertically or hoizontally aligned rows. The distance between the vertical rows should not exceed 36 inches, and the distance between the horizontal rows should not exceed 10 inches. Stamping the specification number into the metal should be used when it is impossible to use the stencil method. It is usually necessary to cut or eliminate the marked portion of the metal prior to using the material for work stock. Therefore, the marking should be located where waste will be held to a minimum. Gothic style numerals and letters should be used; the height may be 1/16 inch, 1/8 inch, or 1/4 inch, depending upon the size of the material being marked. Ferrous metals are those that contain iron as the base metal. The properties of ferrous metals may be changed by adding various alloying elements. The chemical and mechanical properties need to be combined to produce a metal to serve a specific purpose. The basic ferrous metal form is pig iron. Pig iron is produced in a blast furnace that is charged with an iron ore, coke, and limestone. The four principal iron ores are hematite, limonite, magnetite and faconite. Cast iron is a metal that is widelv used. It is a hard, brittle . metal that has good wear resistance. Cast iron contains 2 to 4 percent carbon. White cast iron is very hard and is used mostly where abrasion and wear resistance is required. White cast iron may be made into malleable iron by heating it; then cooling it very slowly over a long period of time. Malleable iron is stronger and tougher than white cast iron; however, it is much more expensive to produce. Gray iron is another form of cast iron. It is used mostly for castings because of its ability to flow easily into complex shapes. Wrought iron is an iron that has had most of its carbon removed. It is tough; however, it can be bent or twisted very easily. Wrought iron is used mostly in ornamental ironwork, such as fences and handrails, because it is welded or painted easily and it rusts very slowly. Steel is an alloy of iron and carbon or other alloying elements. When the alloying element is carbon, the steel is referred to as carbon steel. Carbon steels are classified by the percentage of carbon in “points” or hundredths of 1 percent they contain. (Carbon content up to 0.30 percent or 30 points). This steel is soft and ductile and can be rolled, punched, sheared, and worked when either hot or cold. It is easily machined and can be readily welded by all methods. It does not harden to any great amount; however, it can be easily case- or surface-hardened. (Carbon content from 0.30 to 0.50 percent or 30 to 50 points). This steel may be heat-treated after fabrication. It is used for general machining and forging of parts that require surface hardness and strength. It is made in bar form in the cold-rolled or the normalized and annealed condition. During welding, the weld zone will become hardened if cooled rapidly and must be stress-relieved after welding. This steel is used in the manufacture of drills, taps, dies, springs, and other machine tools and hand tools that are heattreated after fabrication to develop the hard structure necessary to withstand high shear stress and wear. It is manufactured in bar, sheet, and wire forms, and in the annealed or normalized condition in order to be suitable for machining before heat treatment. This steel is difficult to weld because of the hardening effect of heat at the welding joint. This steel is used in the manufacture of chisels, shear blades, cutters, large taps, woodturning tools, blacksmith’s tools, razors, and other similar parts where high hardness is required to maintain a sharp cutting edge. It is difficult to weld due to the high carbon content. High-speed steel is a self-hardening steel alloy that can withstand high temperatures without becoming soft. Highspeed steel is ideal for cutting tools because of its ability to take deeper cuts at higher speeds than tools made from carbon steel. Tungsten carbide is the hardest man-made metal. It is almost as hard as a diamond. The metal is molded from tungsten and carbon powders under heat and pressure. Tools made from this metal can cut other metals many times faster than highspeed steel tools. Steel is manufactured to meet a wide variety of specifications for hardness, toughness, machinability, and so forth. Manufacturers use various alloying elements to obtain these characteristics. When elements other than carbon, such as chromium, manganese, molybdenum, nickel, tungsten, and vanadium are used. The resulting metals are called alloy steels. 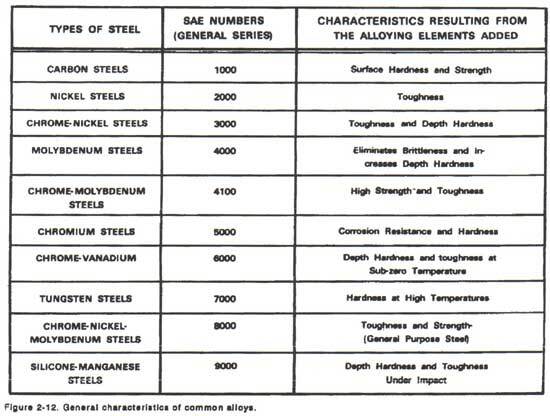 Figure 2-12 shows some of the general characteristics obtained by the use of various alloying elements. There are many metals that do not have iron as their base metal. These metals, known as nonferrous metals, offer specific properties or combinations of properties that make them ideal for tasks where ferrous metals are not suitable. Nonferrous metals are often used with iron base metals in the finished product. Nickel is used in making alloys of both ferrous and nonferrous metals. Chemical and food processing equipment (example: stainless steel), electrical resistance heating elements, ornamental trim, and parts that must withstand elevated temperatures are all produced from nickel containing metal. Alloyed with chromium, it is used to make stainless steel. Nickel alloys are readily welded by either gas or arc methods and can be machined, forged, cast, and easily formed.